App developer Runtastic has carved a sizable ‘niche’ for itself in the digital fitness realm in recent years, notching up north of seventy million downloads since its foundation in 2009. This figure includes all platforms and its myriad of apps – which covers ones for homebodies and others specifically for those wishing to get a six-pack. But the app with which Runtastic is perhaps best known for is the one called – funnily enough – Runtastic, a GPS fitness tracker that lets you monitor, analyze and record your every movement on the tracks or on the roads. Today, Runtastic for Android and iOS received a massive lick of paint and a bunch of new features, and we took a quick look to see what’s what with the latest incarnations. As you can see from the ‘before-and-after’ shots from the Android app below, the main drawer has been spruced up and you’ll see some new features in there too – though these vary slightly between iOS and Android. The design is roughly consistent across both platforms though. 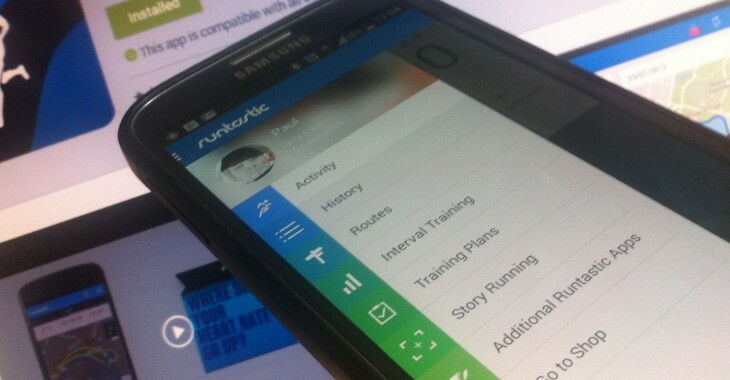 For example, Runtastic Training Plans are now available within Android. Moreover, some features that were previously only available in the PRO version of the app, such as the music player and live tracking/cheering, are now available for free on both iOS and Android. Speaking specifically of the music player, this has now been brought directly into the app, with the music player shifted front-and-center into a separate tab next to the map. Additionally, Android users can also now use Google Music, Spotify, Pandora, SoundCloud and other streaming apps directly within the main Runtastic app, meaning you can skip tracks and pause tunes without fiddling about with third-party services. On both iOS and Android, the main homescreen is now much more customizable, with a long-press letting you choose which features are placed in which position. Not bothered about ‘speed’? All good – you can elect to have ‘duration’, ‘pace’, ‘distance’ and ‘heart rate’ instead. Or any variation of your choice. You’ll also now see a brand new hydration metric attached to your activities, which considers things like your personal stats (distance, speed etc), local weather conditions and more to serve up a post-activity hydration suggestion. In the screenshot on the right, you’ll see that it recommends that I swallow 1451ml of fluids. But preferably that won’t entail beer. The post-activity metrics have also been reworked, both aesthetically and how it’s laid out, with little tabs taking you to different sections relating to your stats. Also, you can now do a color trace to see your pace and heart rate, in addition to speed and elevation. Today’s roll-out represents a pretty significant update for Runtastic, and the clean, colorful design will likely prove popular with its army of users. Still, for me, the Android incarnation shades it over iOS in terms of features – being able to control your Spotify music directly from within the app is a really nice touch. And given you can replay your run afterwards via its existing integration with Google Earth, well, need I say more. The inclusion of a dedicated hydration feature is an interesting one for sure. Though I’d hope most fitness freaks would know roughly how much liquid they should consume after a workout, this at least serves as a friendly reminder. You can grab Runtastic 5.0 from Google Play and the App Store now.